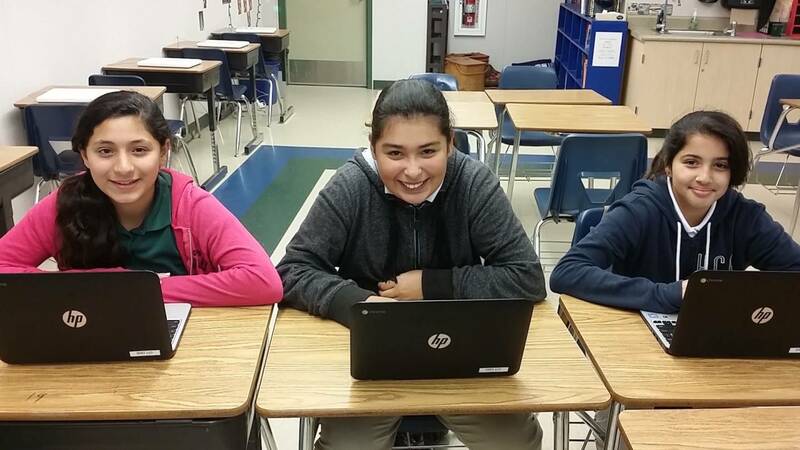 In my middle school, technology is a consistent part of every student and teacher’s daily routine. We are in the third year of using a Math curriculum that has a digital only component. Students are immersed in STEAM activities in electives, and utilize GAFE (Google Apps for Education) in most classes. Just last week, our Special Education Department went 1:1, where each student has access to a numbered laptop all day. We supplement our curriculum with some subscriptions to websites, apps, and programs, but there are also many free, high quality resources available that I use. I frequently use the following four apps/websites in my classroom, and am extremely happy to share them with you. My hope is that you will incorporate some of these programs into your curriculum and share them with your colleagues. Enjoy! Open eBooks is a free resource that is the product of a collaboration between the New York Public Library, the Digital Public Library of America, and First Book. Teachers, librarians, after-school program leaders, and informal educators can access the catalog if they work directly with students who go to Title 1 schools, students with disabilities, and several other qualifying categories. Once registered, you have the option of acquiring licenses for Elementary, Middle School, High School, and all ages collections. Each collection has a variety of genres, of both fiction and informational text. Licenses can be used in the classroom, school library, or distributed to students so they can use them at home. 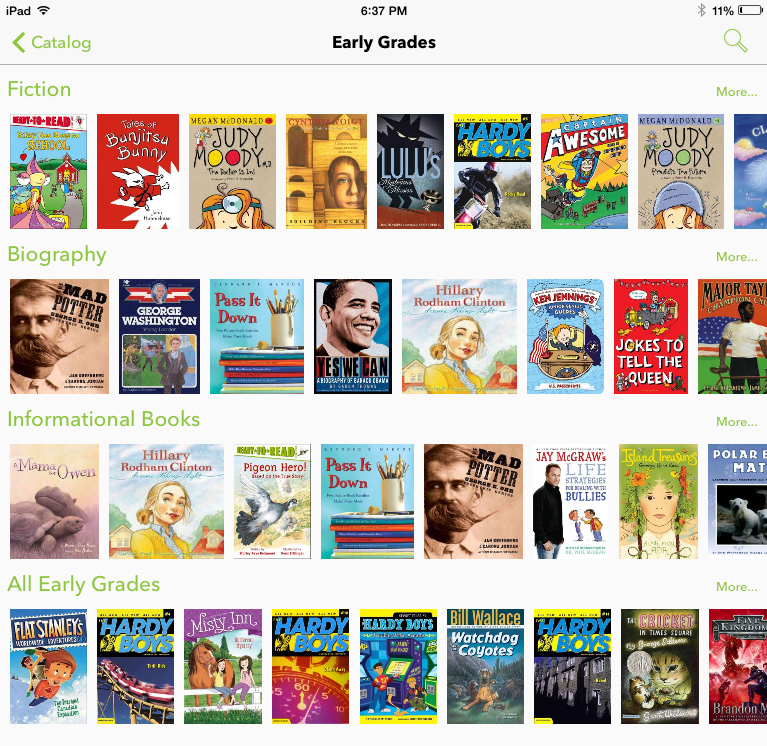 Students can borrow up to ten books at a time, and these books can be accessed through apps for iOS and Android. Once a book is downloaded to the app, it can be opened up and read without needing an internet connection. This makes it accessible to students who may not have Internet at home. I use this tool with learners who may be at different reading levels. Students that are reading above or below grade level access content in different collections, they just need additional an login and key code. It also gives students the opportunity to share reading with siblings. I encourage my students to read to their little brothers and sisters to enhance their own comprehension skills. It’s also a great tool for both small reading groups and book clubs in class, giving me the opportunity to teach and introduce new books to those groups and clubs each year. The current libraries have thousands of titles, and it’s expected that this number will grow considerably this year as more publishers come on board. Take action: The Open eBooks app is available for free in the Apple App Store, as well as Google Play for Android. Register with First Book and request licenses for your students. Take action: Padlet app is available for free in the Apple App Store and Chrome Web Store, and is coming soon to Android. 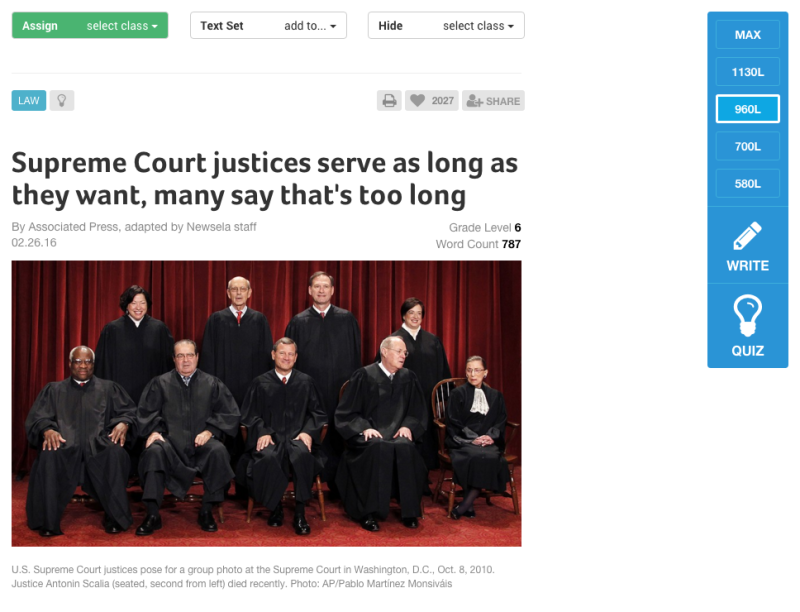 Newsela takes stories from current events, with a wide range of topics, and transcribes them in five different Lexile levels. Stories range from around 530L (approximately 3rd-4th grade reading level) to well over 1200L (upper middle school and high school level) on the Lexile framework. 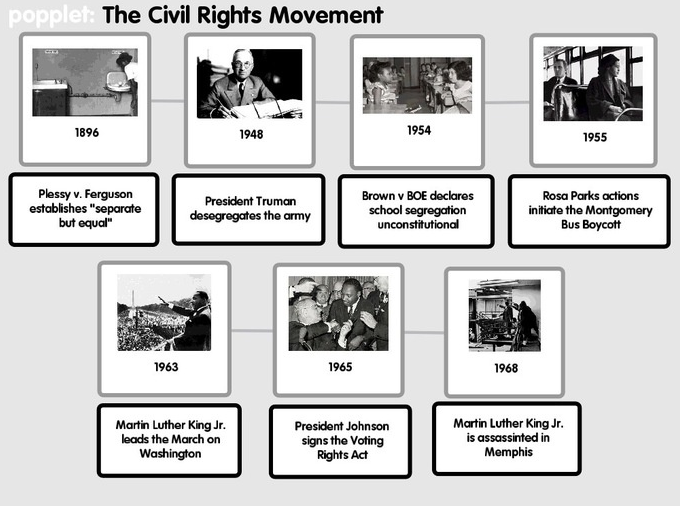 This is a fantastic resource for Social Studies, English Language Arts, and Elective courses where students can participate in discussions after reading content catered to them. Students’ reading assignments never have a Lexile number shown next to them, which lessens the stigma of a student reading below grade level. Find the right Lexile level for your students can help guide instruction, and can help them select books that are in their Independent and Instructional levels. I don’t deny requests to read books above or below their levels, but I do caution them that they may be too difficult (or easy). My students take a Lexile test around six times a year, and it’s great data to have to measure reading progress, as well as to send home to students! If you are not familiar with Lexile levels, you can find more information here. Take action: Newsela is available for free in the Apple App Store and the Chrome Web Store. Popplet is a web-based tool and app that lets visual learners map out their thoughts and ideas in a format that meets their learning style. Out of all the resources I have mentioned in this post, Popplet is the one I was introduced to most recently; a friend of mine in real estate showed me an app that his team uses in meetings to brainstorm and connect ideas. Upon looking at the website, I discovered it was also heavily used in schools! Popplet also works with students who are reluctant note takers, or who have orthopedic issues and cannot write quickly. Several of my students struggle with organization, and it takes them significantly longer to write down a few sentences of notes than other students. Graphic organizers are key in making sure that they are able to get key content down. Providing them the opportunity to capture their thoughts in a format that is stimulating to them ensures further student engagement and progress. Take action: Popplet Lite is available for free in the Apple App Store. The full version is available for $4.99. There are so many more resources out there that support our learners’ diverse strengths, talents, and learning styles. Have you found any that work well for you and your students? Please share them in the comments below! all tools mentioned above sounds interesting and helpfull. Learn how to write a mission statement that will propel your business to amazing success. Whether you’re a new business owner or a seasoned veteran, learn why a mission statement is one of the most important things in your repertoire. writing sop for ms. I have never seen before like this idea.I am very much attached to reading books and stories but I don’t have enough chance to make it happen.Thanks to open ebook for caring our dreams. Kristin Vogel is a Resource Specialist in San Bruno, CA. She has been teaching in the Bay Area for the past ten years, and has worked in a variety of school settings for students with special needs. Kristin brings a strong sense of social justice pedagogy to her craft, and actively participates in local, state, and national advocacy groups to ensure the best education for all students. She resides in San Francisco, CA, and is a pretty big nerd. Prev How Seismic Waves Cause Damage During an Earthquake Next What is Structural Engineering?